South Africa's Chad le Clos avenged his defeat in the 200m butterfly final from the 2015 world championships, beating Hungary's Laszlo Cseh on his home patch. Chad Le Clos of South Africa reacts on the podium after winning the men's 200-meter butterfly final at the FINA world championships in Budapest, Hungary, on July 26, 2017. 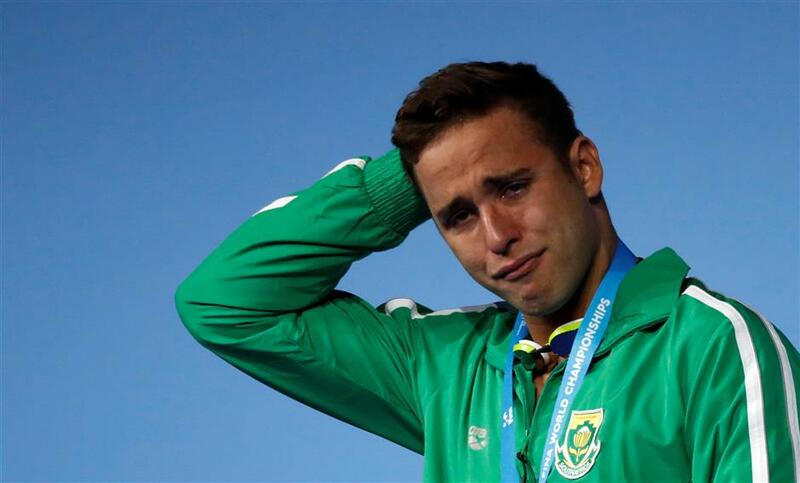 Tears streamed down Chad le Clos' cheeks as the South African anthem was played on Wednesday with both his parents watching on. The 25-year-old won the men's 200-meter butterfly final at the FINA world championships, and there was no checking the emotion following a year of personal misfortune and sporting disappointment. "It was an emotional race — before the race, after the race, during the race — I knew it was going to be difficult," le Clos said. Weeks before the Olympics in Rio de Janeiro last year, the South African star confirmed that both his parents were fighting cancer. His mother Geraldine's breast cancer had returned after her remission in 2010, and his father Bert had undergone an operation for prostate cancer. Le Clos went to Rio as the defending champion in the 200 fly. Michael Phelps, the 2004 and 2008 champion, was seen as his greatest rival. The American took back the title and le Clos didn't even make the podium, finishing behind Japan's Masato Sakai and Hungary's Tamas Kenderesi in what he later called the worst race of his life. Le Clos then took silver in the 100 fly — in a three-way tie with Phelps and Hungary's Laszlo Cseh — behind the new kid on the block, Joseph Schooling. But the podium shutout in the 200 grated the most with Le Clos racing this week for what happened in Rio, in a "very daunting stadium, with everyone cheering for the two Hungarians". Cseh finished 0.39 seconds behind le Clos, Japan's Daiya Seto claimed the bronze, and Kenderesi finished fourth. Le Clos was embraced by Cseh afterward, and he reciprocated by lifting up the Hungarian's arm in front of home fans at the Duna Arena in Budapest. "I think if somebody beats me it is normal for me to chat," Cseh said. "He is one of the best in the world and it is always great to race against him." Le Clos also avenged his defeat to Cseh in the 200 final from the 2015 world championships in Kazan, Russia. Le Clos said he was "very humbled to come out on top and reclaim the medal that I lost last year," but he kept the achievement in perspective considering the personal and sporting setbacks of 2016. "Like I said last year, my family's health is more important than gold medals. I make no excuses for what happened last year. I said it was the worst performance of my life in the 200 fly, and I vowed to come back stronger and trying to win the gold medal, so that's what I did tonight," le Clos said. A rendezvous with Schooling awaits in the 100 butterfly, with the semifinals taking place on Friday before the final on Saturday.